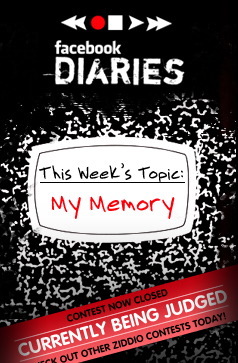 NewTeeVee notes that “Facebook Diaries” launches tonight at about 9 p.m. on Comcast’s video on demand service. I am intrigued by user-generated content mixed together by a professional producer to create a television show unlike any we’ve seen so far. The Web component for the eight-episode, weekly series is already in place as the pilot episode, “Who Am I,” is available on Facebook and on Comcast’s video sharing site Ziddio. The project was announced earlier this year and has Facebook users recording and submitting clips of their lives based on topics such as who am I, heartbreak, road trip, wild nights, and my memory. Left up to the Facebook users, the clips submitted were not that much different, or interesting, than what’s uploaded to YouTube. Good stuff is there, but you got to find it. Not surprisingly, each Facebook clip is rated like YouTube, but many of the ratings were one or two “stars”, which accurately reflected the quality of the content. But adding Cutler is an interesting twist, and the quality of the “Facebook Diaries” — at least in the pilot episode — sky rockets. Cutler, hopefully, has a keen ear to user stories, finding the best ones, editing them in a way that makes the overall program interesting and worth watching, and by doing so takes the whole concept of user-generated content to another level. The clips that don’t make it into a final episode — what falls onto the proverbial “cutting room floor” — may still be of interest to someone and will be available on the Web. It would be nice to have an index, with links of what was used in each episode, what was considered, and perhaps what was submitted. this will be a really cool show. facebook is like the new myspace. and with all the publicity from this show it might overtake myspace. Does anyone remember America’s Funniest Home videos? From a cursory glance, that’s what this appears to be. I know I know, this won’t necesarily be funny, but then neither was Bob Saget.